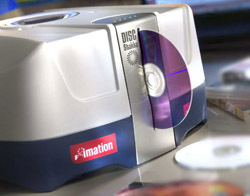 Imation Disk Stakka, manage up to 50 000 discs from one computer | OhGizmo! Built in connectors allow you to stack units up to five high to create a tower that holds up to 500 discs without requiring additional cabling or desk space. And (this is where it gets fun) you can connect over 100 of these towers using powered USB hubs to control over 500 units — that’s over 50,000 discs — all from a single computer! 50 000 DVDs at 4.7Gb each makes 235 000Gb. That, my friends, is 235 terabytes (!! ), all accessible from one computer. The only thing it wont do is actually read the data for you. It’ll just eject the proper disk “within seconds”. But, this is still pretty darn cool, if not cheap. Each unit (not tower) is 149$.